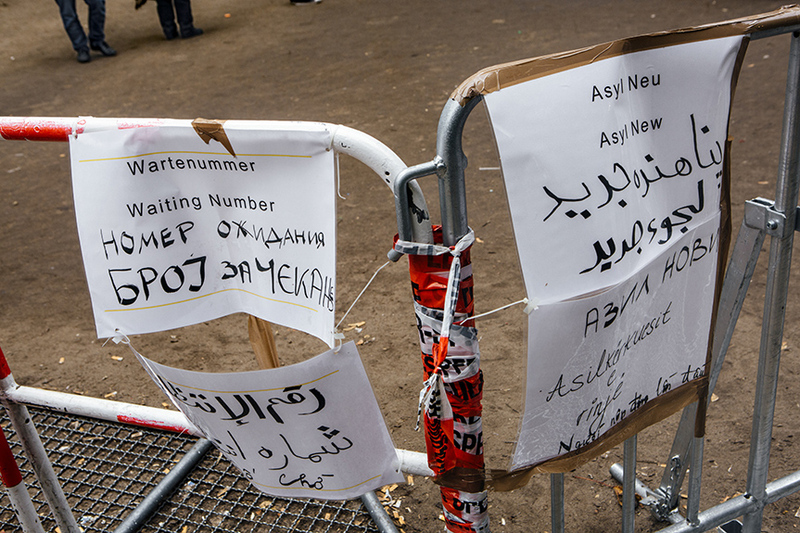 Signs at LAGeSo, Berlin's Landesamt für Gesundheit und Soziales, point to separate lines for people in different stages of the asylum process. The Office of Health and Social Affairs in Berlin’s Moabit neighborhood became a very public symbol of bureaucratic inaction and inefficiency, as growing lines and ensuing chaos during the summer and fall of 2015 signaled that the city government was not in charge of the situation any longer. Urgent needs of food, clothing, and shelter were mostly met by a not-for-profit neighborhood association, Moabit Hilft – another very public symbol of the extent to which German civil society rose to the occasion and picked up the slack where government institutions were slow to mobilize.